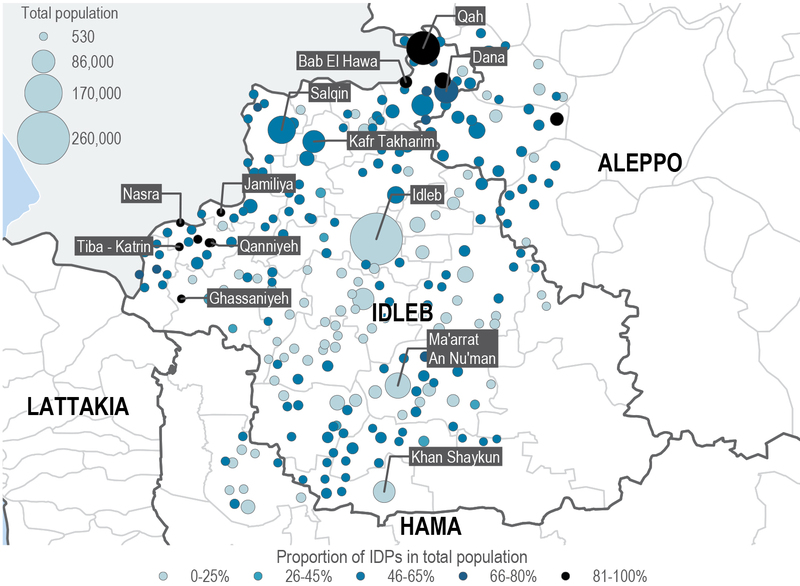 Proportion of internally displaced persons of total population in Idleb and surrounding areas in Syria. 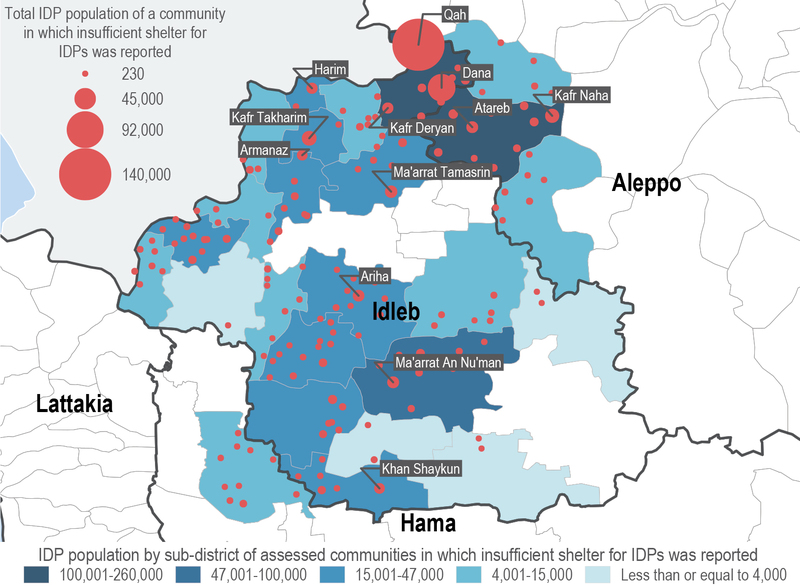 An estimate of 1.4 million internally displaced persons or IDPs reside in Idleb governorate and the surrounding opposition-held areas of western Aleppo and north-western Hama. The figure has come to represent one of Syria’s largest IDP populations and a vast number of people who continue to live in dire conditions in overburdened host communities. These conditions have been further exasperated by the significant escalation of conflict the region has seen since November 2017. Violent clashes between armed opposition groups and government forces have resulted in further waves of displacement to and within the region as new IDPs have arrived from Eastern Ghouta, northern Homs and southern Hama. Even though humanitarian assistance is known to reach both camp and out-of-camp communities, severe gaps in the delivery of services and information on the needs of the displaced remain. In order to address these challenges, REACH launched a multi-sector needs assessment in Idleb collecting timely data on the humanitarian conditions of the IDPs living in the region. A situation overview based on the data was released in July, focusing on the needs of the IDPs living in host communities. The data was based on interviews conducted in May with key informants from 255 communities. The assessment successfully gathered information on the conditions of more than 1.2 million IDPs, covering the vast majority of the IDPs known to reside in the region. According to the findings, the humanitarian situation faced by the majority of IDPs remains precarious. Conflict and displacement have created considerable strains to services, and IDPs continue to have limited or no access to basic services such as healthcare, water and electricity. Furthermore, several informants reported IDPs experiencing significant barriers in accessing livelihood and education opportunities. Moreover, REACH found that almost 20 percent of IDPs live in overcrowded or unsuitable shelters, and several informants underscored the continued risks to safety and security, including threats posed by air strikes, explosives and mines. The majority of IDPs reportedly expect to stay in their current host communities and camps, meaning that the strain on host communities, local services and infrastructure will remain for the foreseeable future. In addition, airstrikes, shelling and continued tensions between armed opposition groups are likely to trigger further displacements eventually. REACH found that almost 20 percent of the displaced people live in overcrowded or unsuitable shelters. The graph maps the location of communities where insufficient shelter was reported. As restrictions on movement deepen, a potential offensive or the further escalation of conflict is expected to heavily affect all communities living in Idleb and surrounding areas. As long as severe humanitarian gaps remain unaddressed, the potential of a humanitarian catastrophe in north-west Syria will persist. For a more comprehensive overview of the findings from REACH’s work in Syria, visit the REACH Resource Centre and read the full Situation Overview: Idleb Governorate and Surrounding Areas.